Last I heard, no one lives forever. Estate planning, which deals with providing for ourselves as we age and taking care of loved ones after we are gone, is a constant reminder of that fact. So it’s easy to understand why many people think this is a morbid topic and put off doing anything about it. Nearly 2.6 million Americans die each year, and many haven’t signed the basic documents needed to protect those they care most about. I wrote this book to guide you through what can be a difficult and very emotional process. That’s true whether you are tackling estate planning for the first time or revising your plan to reflect changes in the law, your finances or your personal life. The best place to start is with this book’s Table of Contents. It can help you identify the chapters that apply to you. Each chapter cross-references others but is designed to be freestanding. At the end of every chapter is an action-oriented To-Do list based on material covered in that chapter. You can read a sample chapter here. 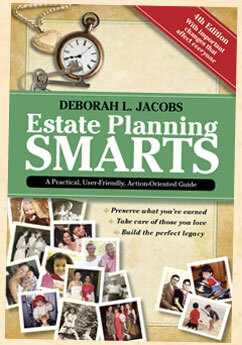 Estate Planning Smarts is not a substitute for legal advice, but it can be a continuing resource. When there are new developments between editions, I keep readers current by tweeting, posting free updates on this Web site and blogging. You can register here to receive e-mail notifications of updates as they become available. This is a subject that affects us all. Let’s keep the conversation going. To see other portions of this Web site most relevant to your situation, please indicate whether you are interested in this book for yourself, or for a friend or a family member, or whether you are a professional who works in estate planning or a related field. Copyright © 2011-2018 DJWorking Unlimited Inc.